I actually have a pretty sweet vintage pattern stash that came from a friend of my parents. In the past I was loath to use them because they are single sized and the wrong size, but after taking a couple of Palmer/Pletsch classes I am way more comfortable with adjusting paper patterns! 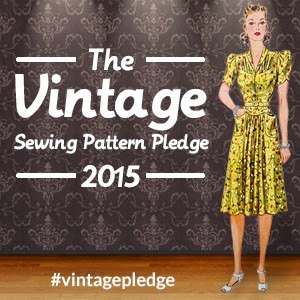 So I’m taking the Vintage Pattern Pledge this year! During 2015, I, Lorene , will sew up at least three of my vintage or reproduction sewing patterns.